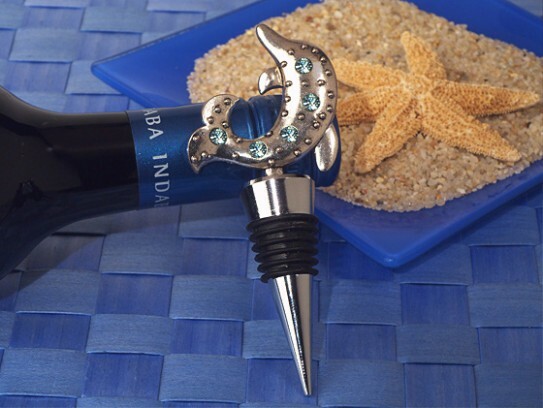 Top off your perfect beach theme party with these awesome dolphin design wine stoppers. Each solid chrome metal wine stopper is accented with a chrome metal dolphin design topper accented with the perfectly placed blue crystals and attached to a chrome metal stopper base and measure 4.5" long. 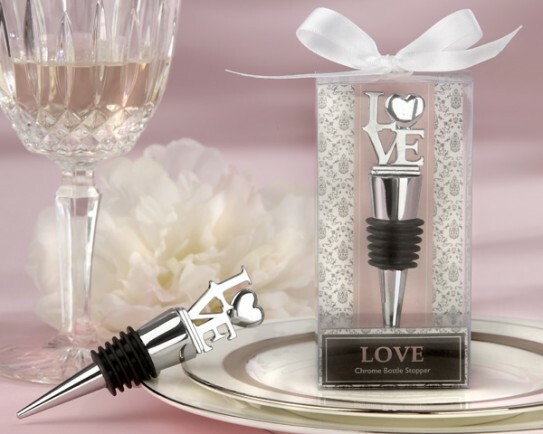 Your guests will be reminded of your special day every time they use these practical wine stopper favors. Best of all they are ready for gift giving, they come packaged in an elegant silver gift box wrapped with an organza ribbon. When love is all around, no matter the occasion, you can't help but want to share it with your guests. 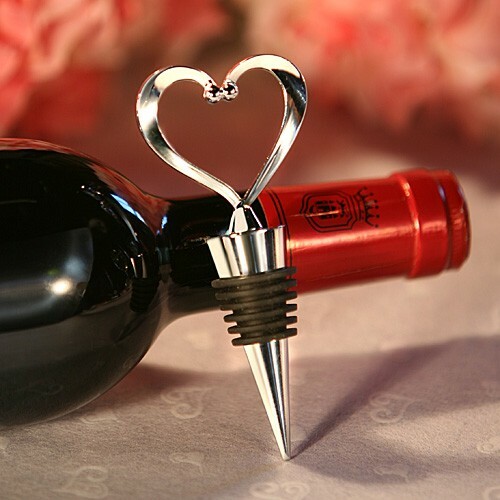 Family and friends can take home a little piece of your heart with the right favor, and the time-honored ï¿½LOVEï¿½ Bottle Stopper truly has heart. LOVEï¿½ Bottle Stopper is made of solid chrome, with a notable weight and quality. Classic ï¿½LOVEï¿½ design includes a heart in place of the ï¿½oï¿½. Bottle stopper measures approximately 4ï¿½ h x ï¿½ï¿½ w. Clear gift box holds bottle stopper in an elegantly designed, pink, gray and white base with damask design, and atop the gift box is a pure-white, satin ribbon. Gift box measures 4 ï¿½ï¿½ h x 2ï¿½ w x 1ï¿½d. Looking for the perfect beach theme favor? 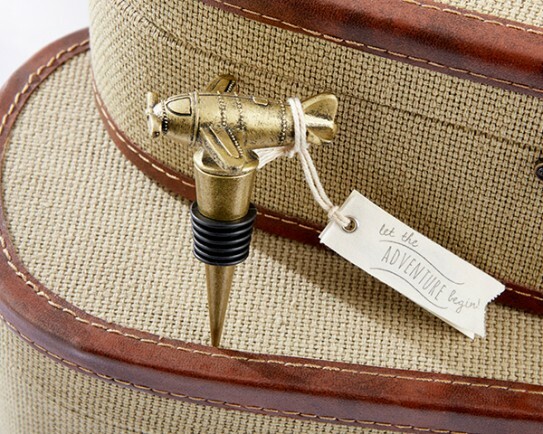 Then Impress your guests with these unique combination Wine pourer, wine stopper favors. 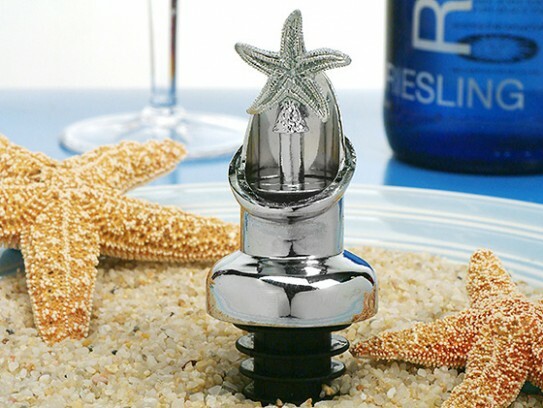 Each elegant Solid chrome metal Wine pourer is adorned with a starfish design stopper. These favors will remind your guest of the fun they had at you beach themed party every time they sit down to enjoy their favorite vintage. Best of all they come ready for gift giving in a elegant black velvet lined gift box, and finished with an organza ribbon and Unique Beach theme thank you tag. They measure 3.5" tall. 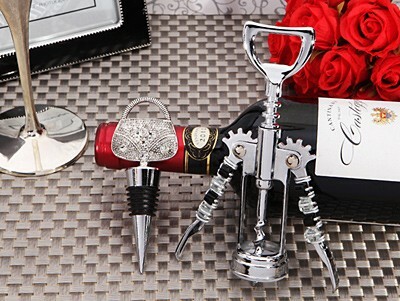 These unique Wine opener and stopper combination favors will show your guests you appreciate them spending this special day with you. Dazzle your guests with our exclusive Signature collection favors. Each set has a metal wine stopper with a stylish shoe design encrusted in stunning clear crystals attached to a solid chrome metal base, the solid metal wine opener is accented with perfectly placed clear color beads. Sure to be appreciated by the wine enthusiast in the crowd. They each come packaged in an elegant two piece white gift box stamped with our Signature collection logo and set in soft white satin lining. Each stopper measures 4.50" in length and the wine opener 6". Our dazzling diva handbag favors will impress your guests on your special day. These unique Wine opener and stopper combination favors will show your guests you appreciate them spending this special day with you. Each set has a metal wine stopper with a stylish handbag design encrusted in stunning clear crystals attached to a solid chrome metal base, the solid metal wine opener is accented with perfectly placed clear color beads. Sure to be appreciated by the wine enthusiast in the crowd. They each come packaged in an elegant two piece white gift box stamped with our Signature collection logo and set in soft white satin lining. 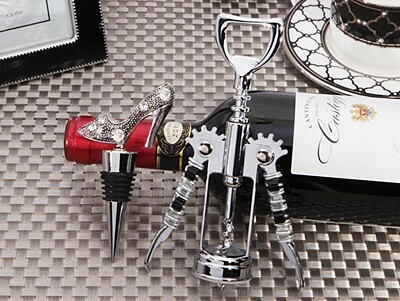 Each stopper measures 4.50" in length and the wine opener 6". Looking for unique event favors with lots of flavor? These wine stoppers are all heart. 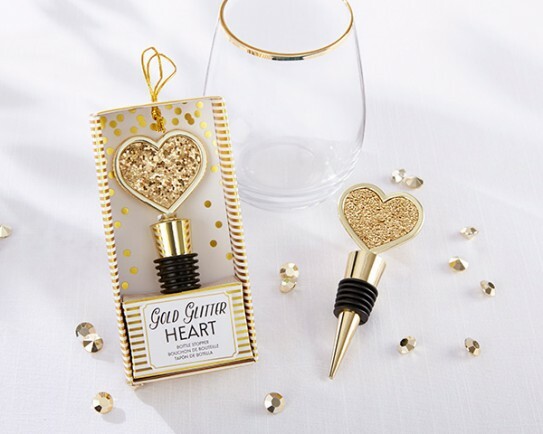 Wine themed favors are surely the rage and these wine stoppers will add a memory-filled moment to each bottle your guests uncork. Modern and practical, these sturdy stoppers feature a perky molded chrome heart shape on top of a chrome base wrapped with a thin black liner for a snug fit. Each exclusive favor measures 4.5" x 1.75" and comes individually packaged in a white box.